I’ve been calling Paul almost every day around noon to asking him if any RSVPs have come in the mail. I want to know who’s coming to our wedding. Let me tell you that even with a few days left to return them, I am starting to hound people. My brother still hasn’t sent his so go figure. When I called on Friday, Paul failed to mention to me that a package came in. A very delicious package with the contents clearly marked on the outside. I’m surprised that Paul didn’t just go ahead, rip it open and finish it up before I got home because he loves those cookies. I like them too but I don’t love them. But they are certainly better than those Keebler knockoffs. Gag. 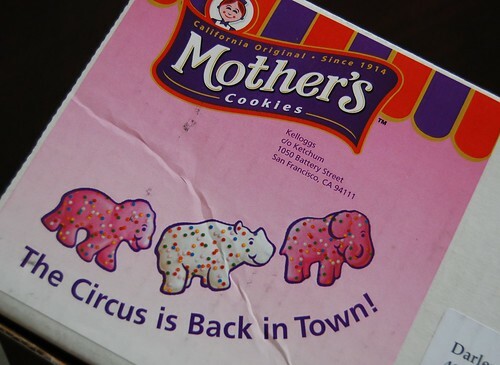 The cookies were mailed to me from Kellogg’s via Foodbuzz because Kellogg’s bought the trademarks and are continuing the production of Circus Animals. And they return to store shelves on the West Coast starting May 4. Today and they taste exactly the same. As for me, I’m not rushing off buying them anytime soon because that bag more than satisfied my sugary addiction for those frosted cookies. Circus Animals, Kelloggs, Where the hell is your RSVP? The optimist sees the donut. The pessimist sees the hole. Diane–Ditto on that celebration.Mia–I agree. So glad they're back.